Beer lovers rejoice! Pioneering craft beer brand Little Creatures has spread its cherubic wings to land in Hobsonville Point’s sun-drenched Catalina Bay, where it will open its first New Zealand brewery in February, 2019. Housed in an historic seaplane hangar that overlooks the Hauraki Gulf, Little Creatures will quench thirsts with an extensive range of craft beers and three onsite dining options. The brewery will kick things off with a launch extravaganza on Waitangi Day, February 6th, with live music, entertainment and many more curious surprises. Head Brewer Udo Van Deventer, will oversee brewery operations as well as the comprehensive range of beer on offer. 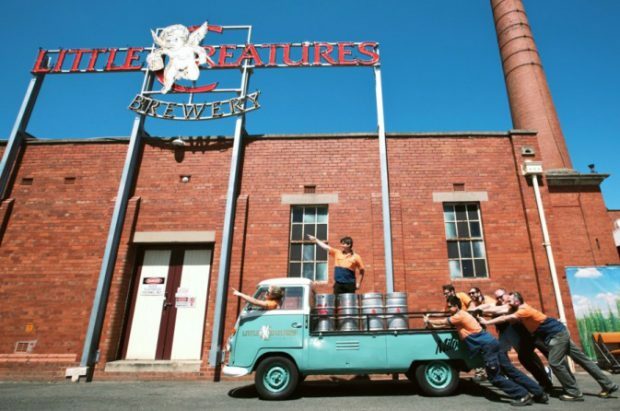 Little Creatures favourites like Pale Ale and Pilsner will be on the menu alongside new additions to the New Zealand market, Dog Days and Rogers, as well as seasonal variations. “We’ll have a special limited release beer for launch and then as we move into the colder months, we’ll introduce Amber Ales and beers best suited to winter,” Udo says. “We’ll also be constantly talking to locals and tailoring the menu to suit what they want to drink.” Brewery goers can choose from a bevy of food options, anchored by Little Creatures’ menu featuring wood fired pizzas, snacks, shared plates and hearty meals – think Natural Rock Oysters, Buttermilk Fried Chicken Sliders and Lamb Shank Pie. Two additional dining options are located inside the brewery – Salty’s, serving up premium seafood dishes including a variety of fish & chips and seafood delights, and Kittyhawk, a café bistro, which will offer an all-day dining menu, coffee and extensive range of fine wine and cocktails in an intimate environment. Ignite Architects spearheaded the design of the warm and welcoming brewery, which is filled with nostalgic design elements that nod to the history of the almighty Sunderland Hangar. Built to house TEAL’s giant Seaplanes in 1939, the hangar’s original 9m tall doors can be spotted behind the main bar. KittyHawk’s vibe is that of an officers’ mess where mechanics and pilots would enjoy a cold one after-hours, while Salty’s bar is made from the hangar’s original timber purlins. The hangar’s concrete floor has been retained, proudly showing off its cracks, imperfections and heritage. On top of all this, there will be an epic kids play area with a fort and sandpit. To celebrate the official opening, Little Creatures will host a family friendly carnival on Waitangi Day, 6th February, from 11am. Free for the public and open to the whole family, the launch extravaganza will showcase entertainment from musicians like Sola Rosa Sound System and Josh Leys, mind-bending contortionists, mystical fortune tellers, wizardly face painters and much more. Little Creatures Brewery is located at 3 Boundary Road Hobsonville Point. For more information, customers can visit www.littlecreatures.co.nz.